With this accurate Mexico email database, you will be able to directly contact your target audience and build strong sales leads. This targeted email list contains all of the information you need to conduct a successful marketing campaign in Mexico. Selling in Mexico can be very profitable when you have this human-verified Mexico email list. Each business mailing list we sell is tailored to your specific needs: In this case, this pre-built list is the perfect option for those looking to expand their business across Mexico. We have the accurate names, email addresses, phone numbers, and other contact information you need to build a reliable business contact list. Use our Mexico email database as the cornerstone for your full business database and watch your sales soar! We work hard to make sure that your Mexico mailing list has accurate information and valuable contacts. You need a reliable Mexico email list to grow your business, and we take that responsibility seriously. With our B2B email list, you can connect with power players at businesses throughout Mexico. No matter what industry or profession you need to talk to in Mexico, we have the bulk email list you need to get positive marketing results fast. 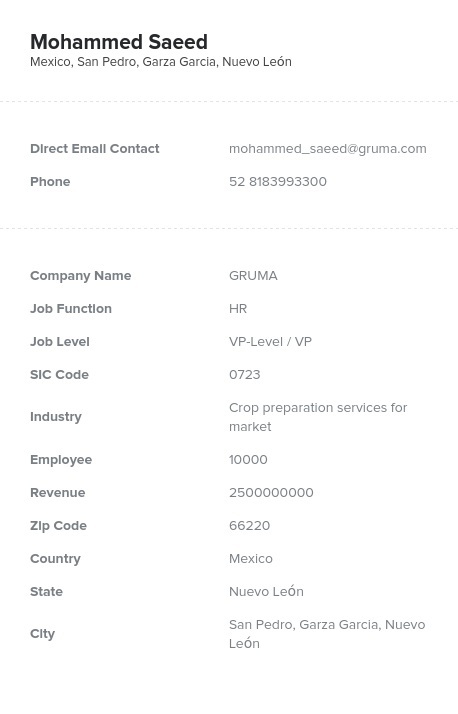 And our Mexico email database is human-verified, which means that we personally remove outdated content to make your business mailing list more valuable. Contact Bookyourdata.com today and get the Mexico mailing list you need to get your marketing campaign started.